Clear the clutter from your desktop with this all in one desktop organizer. This combines the warmth of wood and functionality in one elegant piece. 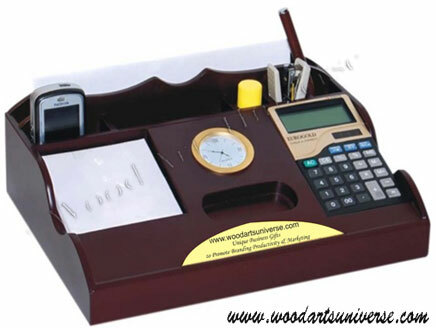 It features compartments for Android / Blackberry phones, business cards, Pens and pencils, notepads/ post it notes , wooden pen, calculator, clock etc., and is an elegant way to dress up the work area. This all in one desktop organizer makes a great gift item.